We all know to caulk around the windows inside and out. We can further improve insulation with the window treatments. I put sheer curtains inside my window frames during the winter and the hottest months of the summer. I use spring pressure rods to hang them. You can also use cup hooks for lace curtains. It is just another layer between the glass and the inside air. I have blinds, drapes and valances that reach nearly to the ceiling on every window. When the temperatures dip below zero I have three full layers of insulation on them. I can open the drapes completely during the nice days to let the sun warm the room. On overcast days, I keep them partly closed. Another way I improve the insulation around the windows is to sew Velcro (hook and loop) tape on to the outside edges of the curtains or drapes. I use self-stick Velcro dots on the walls. I put the hook side on the walls and sew the loops side on the curtains. I paint the dots the same color as the walls and they are really not noticeable. 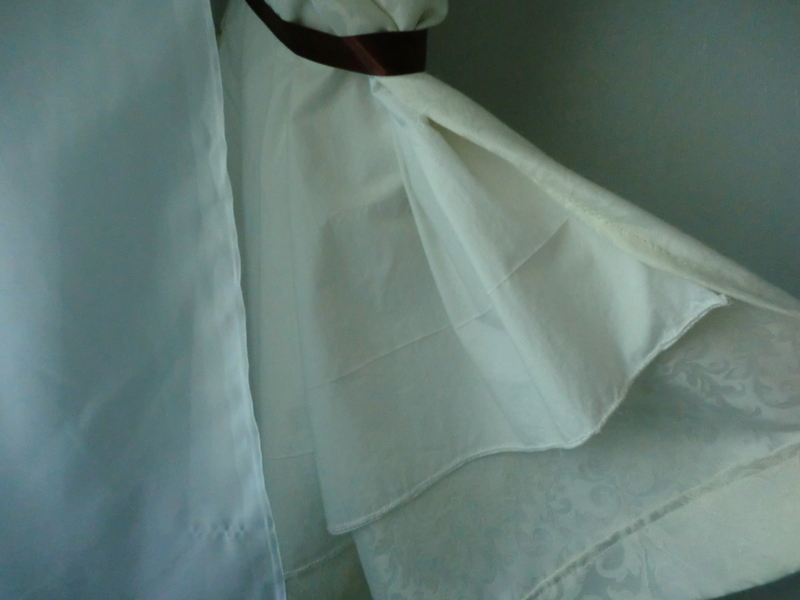 The result is drapes that seal along the edges. Remember when purchasing drapes or curtains to look for insulated drapes with the energy efficiency seal. You can also insulate them yourself by sewing a white sheet to the top and sides. I insulated these curtains by sewing a white sheet to the inside of them. This entry was posted in Energy Efficiency, Make It and tagged Energy Efficiency, Make It by Frugal Fish. Bookmark the permalink.